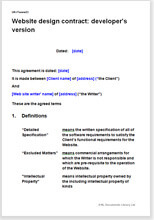 This is a full contract website coding document drawn to be presented to a client by a software house, There may be negotiations over the detail or you may insist on your client taking it as it is. It covers graphic design, records, testing and all other areas of your work. No professional can afford to risk the misunderstandings and possible disputes that arise so commonly in this area of work. This agreement is in plain English so that your client can never say it was not clear. This document will protect you from many legal pitfalls at the same time as it will provide a thorough framework for the legal relationship and the progress of the work. It includes an example specification of work, but note that this is not in technical terms. Technical material will be entered into the specification by you, the technical expert. Extensive drafting notes explain even more. Your customer will approve the website design in stages but pay for additional work on an agreed basis. Procedure concerned with writing of a "Detailed Specification" covering all elements of the website design work, to provide a precise instruction to you and a record of the work for your client. Regulating customer changes to the specification. Providing concisely for responsibility for search engine strategy and other matters where you require certainty. Lists excluded matters for client's separate attention - e.g. names, hosting; payment service provision. Clear and strong identification and protection of your intellectual property. Appropriate legal provisions - exclusions, indemnities, etc. Regulating customer changes to the website design specification so that it is clear what work is "extra". If your client requires either a technically simple site or merely re-structuring of an existing site, you may be better suited to our Website write or edit agreement: coder's version. We have a set of associated documents at Web design agreements. "An extremely simple and painless process to get the best legal documents available. Thank you very much."